Cressida filming in District 8. 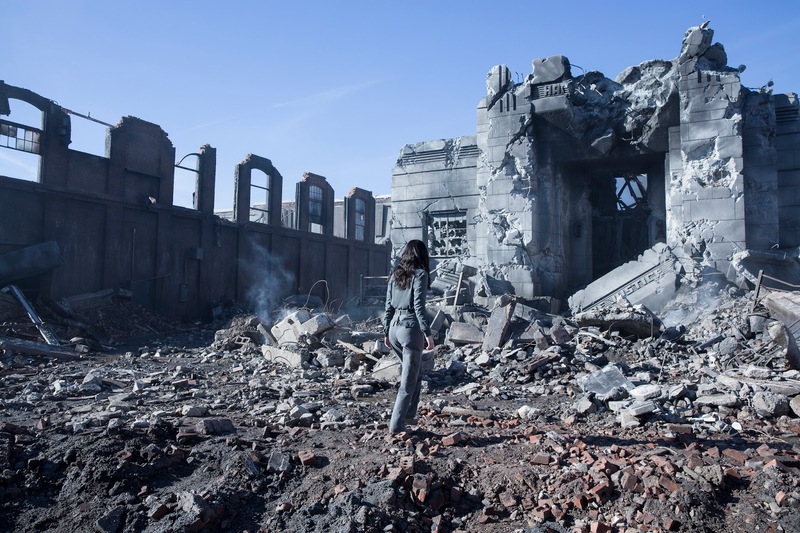 This is a review by Germany staffer Carla Pinilla, who saw ‘The Hunger Games: Mockingjay – Part 1’ in its original English version on Wednesday, November 19th, 2014. Warning 1: This review will contain spoilers. Please read at your own risk. Warning 2: This review will be long. Very long. Carla has a lot of feelings. “I feel so nervous,” I told my friend as we were riding the escalator up to the theater to watch Mockingjay Part 1 on Wednesday night. “My stomach is churning like I’m about to take an exam.” And the real triumph of this movie is that said sensation stayed with me through the whole film. In fact, it followed me through the night and into my dreams, and even come the morning I was still feeling the anxiety and queasiness. If you know me, you know that I’m an emotional kind of audience; I don’t mean that I’m prone to crying or anything like that, but I tend to look back at movies not in a scene-by-scene or attribute-by-attribute basis, but instead in terms of how they made me feel overall. That’s what really determines, for me, whether a movie was good or bad. So believe me, when I say Mockingjay Part 1 left me feeling like I’d been punched in the gut for over a day, I mean that as a compliment; it’s not something that can be said of many movies, in my experience. Last year when I reviewed Catching Fire, I described it as “an emotional thrill ride.” There was a thrill in the action growing grander and grander, with the emotional aspects peppered throughout to give it a real feeling, a weight that made you feel like you were rushing up-and-down, the feeling that you were riding a roller-coaster. Mockingjay Part 1 also feels like they’ve put our emotions to play on a particularly violent see-saw, but in a different way: it’s the constant reminder that things are going to get worse and worse, contrasted against our attachment to these characters and unfailing hope that they will get the happiness they deserve. Intellectually speaking, even the people who haven’t read the book will know that we’re not getting a happy ending in this film, as there’s still Part 2 to go next year, but that doesn’t stop us from rooting for these characters, and being emotionally torn down when it doesn’t happen. Once again, the grim tone is skillfully set by director Francis Lawrence from the very first scene, and it never lets up. You know, from the moment you hear Katniss muttering her survival mantra to herself in that dark air vent in Thirteen, that this is going to be a movie about human suffering, more than it is about war itself. To put it in perspective, it actually crossed my mind at one point that I was surprised they gave Katniss a belt to wear—the beginning was that somber. And the grey, dimly lit set design in District Thirteen underlines this better than I could have hoped, to the point where even I, as someone who doesn’t have a particular problem with enclosed spaces, started feeling claustrophobic. The place felt like a giant concrete cage. A quarter into the movie, the orange tone of the lights was already giving me a headache, and while others might be annoyed by this, in my case it made me understand these characters even more, their drive to fight this battle so they could get out from underground and into the sun, into freedom, reclaiming what they once had, what is their right. Katniss returns to District 12. And regarding other sets, let’s not forget about District Twelve. When Katniss stepped on that skull (they kept that in! Wow!) I let out an audible groan; it was so much more gruesome, seeing the dead bodies at the cinema than it was seeing it on my computer screen. Also the District 8 scenes, which were so true to the book that they almost gave me a heart attack for a moment: in the book, Katniss and Gale go to the roof of a building to shoot the hovercrafts and they meet Paylor there… so when they started running up the stairs in the movie and they get to the roof just to see someone get shot, I thought for a moment that they’d actually killed Paylor and I almost started freaking out. Thankfully that was just my overactive imagination, but it goes to show just how similar the setting was to what I imagined for those scenes in the book. I’m guessing they filmed that in Atlanta as opposed to Berlin as I’d expected, since the credits only stated this movie was filmed in Atlanta and Paris. As far as the script itself goes, I was quite happy with how close it stuck to the book. True, they did a lot of tweaking and adding to the plot, mainly to show us what was happening outside of District Thirteen, but I was hoping for that, because I believe that’s the advantage of a movie adaptation: it does, and should, allow for more freedom than a first-person PoV book. But even so, I have to give it to them: not one added scene felt like filler. The scenes in the Capitol with President Snow were chilling, not just because of Donald Sutherland’s performance, but because it’s always intense to be a fly on the wall when the most ruthless decisions are being made. The entire rescue scene was an amazingly tense, dark sequence, splicing the shots of the team in the Capitol with Finnick’s monologue and then Snow’s conversation with Katniss to cap it all off. The rebellion scenes themselves were some of my favorites, not only because of the action and special effects, but because of the emotional impact of these people giving their lives for a cause in a very literal way. And the movie never let you lose sight of what their cause was: the Mockingjay whistle being the rallying cry, followed by people getting shot as they climb trees to activate bombs against the peacekeepers; the crescendo of The Hanging Tree as people rush forward in a human shield just so a select few could get inside the dam and set off the explosives. It was a delicate thread that was very well set up as well, as the dam breaking led to the black out in the Capitol, which then led to the opportunity for the rescue mission. It was a very smart way of making things happen organically, of creating chances for both emotional depth and plot advancement. Speaking of the dam and the black out, though, the SFX were absolutely on point. Though part of me did feel like maybe there was a bit too much of the hovercrafts flying over the forest, the “big” action scenes more than made up for it. The destruction of the dam was a thing of beauty, all sweeping landscapes at first and then such immense, majestic structures up close. I’m still sitting here trying to wrap my head around the question of “HOW did they do that?” My favorite CGI moment, however, has to be that little moment when we see the hovercraft flying through a darkened Capitol. Maybe it was just my anxiety over the rescue, but it looked like something that belonged among the sci-fi greats. Simple and understated, but it really drove home the feeling that this was a covert mission, that the team going in was the equivalent of a military/SWAT team that broke in and out in darkness, without leaving a trace. Pardon my descent into fangirlese, but it was just sooooo cool. When the movie was in production I wasn’t expecting it to be CGI-heavy, at least not Part 1 (there’s many sci-fi moments during the assault on the Capitol, but comparatively Catching Fire has always been the most sci-fi book in the trilogy for me), but those little details added so much to the overall feel of the film, and I loved it. Katniss watches a broadcast from District 13 Command. When it came character development, it was very important to me that Katniss’ breakdown after the events of the first two movies was done right. The Hunger Games franchise is being touted as one of the few movie series that presents a strong, kickass leading lady that gives girls everywhere a positive role model to look up to. And while that isn’t incorrect, the idea always leaves something of a weird aftertaste in my mouth. It’s great that people see Katniss as this amazing action hero, because there’s not many female action heroes out there. Yet, what makes The Hunger Games a true victory for feminism is not that Katniss can shoot arrows and save people; it’s that Katniss is portrayed as a real girl. She is strong and kickass, yes, but she also has her moments when she feels weak, and hurt, and vulnerable, and this is okay. It’s okay to feel down, it’s okay to take time to process and grieve. I needed this to be done right, and I am thoroughly satisfied with its execution. Even in-universe, Katniss is never truly looked down on for feeling despondent. It’s never presented as something that’s wrong; they may need her to push it aside to rally the troops, but they never look at her like the way she feels is wrong. Grief is taken as a given, logical consequence of the situation she’s gone through, as it should be. It’s something I hope the audience gets from the film, because I certainly did. 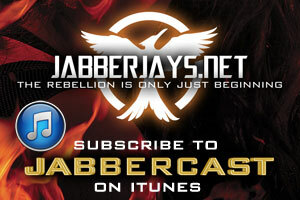 This is in large part thanks to Jennifer Lawrence’s performance as Katniss. To say this young woman is a treasure for Hollywood, let alone for our fandom, is an understatement. I always go into a Hunger Games movie expecting to be blown away by her performance, and every time I walk out with the feeling that “blown away” is just not enough to describe it. I can’t imagine anyone else being handed a script that consists of so much crying and shaking and hiding in vents, and making it seem so bloody interesting. She makes us feel not only for Katniss, but for anyone who ever has had to experience suffering in a grand scale, from soldiers, to people who have lost everything in disasters (natural or otherwise), to those who have had to experience the loss of a loved one. All that pain is reflected there in Jennifer’s expressions, and it takes an amazingly talented actor to deliver a performance so all-encompassing with so little action. Also, seeing her act like a bad actress was such a hilarious treat, I will be laughing about that one (in a good way!) for a long while. While Katniss was definitely the focus of the film, the supporting cast was flawless, as far as I’m concerned. 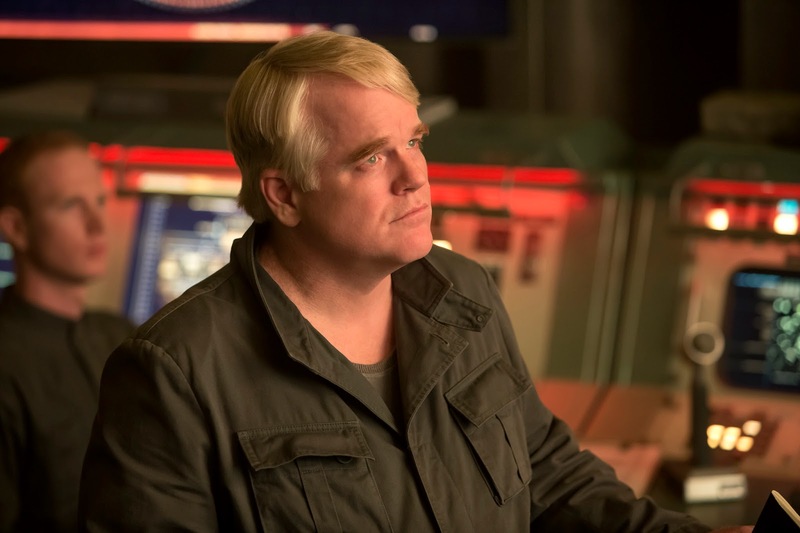 If I had to choose an MVP, I’d have to go with Philip Seymour Hoffman as Plutarch. This is mainly because walking in, I wasn’t really sure what to expect from Plutarch. It had always been a bit jarring for me, the change the character goes through from Catching Fire to Mockingjay in the books: he’s so shady and suspicious in the former, with his salesman attitude and his hidden Mockingjays, but when his secret allegiance is revealed, he seems to take on the role of just another Capitolite caricature, and that never sat well with me. I wanted them to hold on to Plutarch’s more serious side but without dismissing his Capitol origins, and from the trailers it seemed like they were going full-on serious with him. But they managed to strike the most perfect balance, affording him enough importance that he seemed like more of an advisor rather than the “demoted to propo producer” tone he had in the book. He still had the feel of the chessmaster he came across as in Catching Fire, the man who double-crossed President Snow himself, and Hoffman made the character so well-layered. Little things like smirking when President Coin said something that came across as way too inflexible, or commenting on how succinct her speeches were. There’s the gamemaker, there’s the man who can show you how to win, and you can’t help but take him seriously despite the fact that he very obviously doesn’t fit in with the Thirteen crowd. It was handled so perfectly, and it made me sad all over again for Hoffman’s loss. The new additions to the cast were all very good as well. I admit I was nervous about Julianne as Coin, with all this talk of her bringing a “warmth” to the character that wasn’t in the book. In her first few scenes, I was watching like a hawk for any hints of deception, and I couldn’t really find any. To be honest, while I liked that she made the character hers, even as I walked out of the theater I was still feeling worried that she came across as “too nice, too encouraging.” It wasn’t until I gave it more thought, in the hours after I came home, that I realized that was the genius of it: Julianne almost makes you feel like Coin genuinely cares for Katniss, like she identifies with her pain and wants to see her succeed personally as well as rebellion-wise, and it’ll make the reveal of her true colors in Part 2 all the more shocking. And now I can’t wait to see that. Whoever it was who had the idea of those subtle changes to Coin’s character, I’m no longer a skeptic; I wholeheartedly approve. 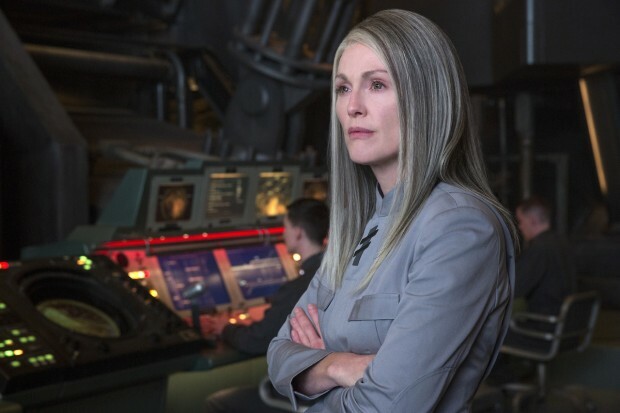 President Coin in the Command room in District Thirteen. 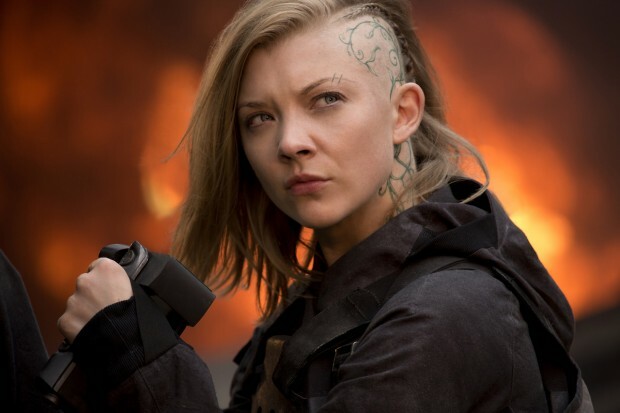 Natalie Dormer is my queen and I was expecting her to be badass, and she was. You could see in her expressions that she was trying to convey a nice balance between being impressed and moved by Katniss and still pull her duties as director as neutrally as possible, and I look forward to seeing more of that balance in the next movie. Pollux was adorable, although I would’ve liked to see more of Castor and Messalla as well; Messalla in particular, because Evan only had one line, and I wanted to be given more of a chance to get attached to him, knowing what’s coming up in Part 2. But I have no complaints whatsoever about any of their casting. The decision to have Effie in District Thirteen is one of the best decisions that has been made in this entire franchise. She was a breath of fresh air, introducing some much-needed humor in a way that was not over the top at all, proving that Elizabeth Banks doesn’t need the crazy costumes or the make-up to make Effie feel like Effie. Her first scene with Plutarch remains one of my favorites in the whole movie, and the little moments she got to show off her Capitol flare, like being distraught at Coin’s utilitarian look and the little wave she does when raising her arm at the conference room, all made me smile. I’m so happy this decision was made. So happy. On the opposite end of the spectrum, Donald Sutherland was at his most evil in this movie. In his added scenes in the Capitol, he demonstrated being completely in control of a situation that was quickly growing chaotic; those scenes of him declaring punishment on the rebels in the districts were so dark and ominous they made my throat dry up. On the other hand, I’ve always felt that Snow had an unhealthy obsession with Katniss, and their scene together during the rescue mission proved that and then some. It wasn’t even his words; he need only stand on-screen giving her that crazed, sickly, “amused yet entertained by your poor attempts at tricking me” look to make me shiver. I found myself chuckling nervously because I didn’t know how else to react. 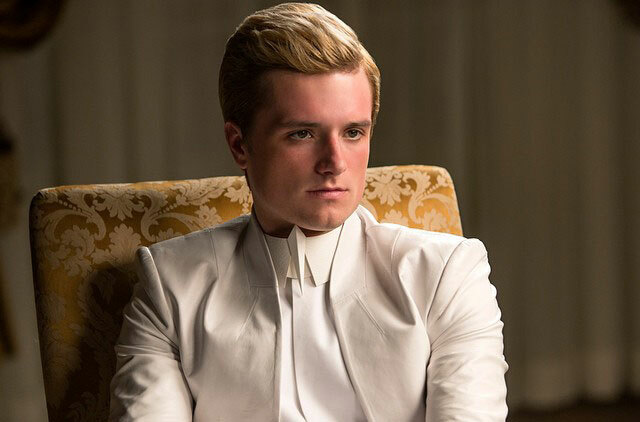 Peeta being interviewed by Caesar Flickerman. 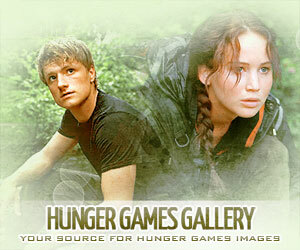 Out of the young cast, it was Josh Hutcherson who really stood out to me. Sure, he didn’t have that much airtime, and to be honest I thought I had seen all I was going to see from Peeta in the clips that had been released, but I was wrong. So wrong. Nothing could have prepared me for that last, mostly-unseen interview, and it broke me. I’ve always said Josh conveyed more with his eyes than he did through dialogue, and this time it was more than just his feelings for Katniss. When he notices how Beetee is interrupting his transmission with a feed of Katniss, you can just see in his eyes that he’s quickly piecing everything together: that Katniss is still alright, that she’s still fighting, that Twelve is destroyed and that he can help her directly. All of this in a matter of seconds, but Josh transmits that urgency so well. It blew me away. And I can’t even begin to put post-hijacking Peeta into words; I was prepared for the choking (I think I held my breath as soon as Gale pointed Katniss in Peeta’s direction, and I didn’t resume breathing until the credits started rolling), but I was absolutely not mentally prepared for the brutality of it, the throwing people across the room and swinging them into walls and smashing them against class cases. It was way more than I was expecting, it was painful to watch, and I can’t wait to see what Josh does with such a damaged character in the next movie. Liam gave Gale a vulnerability that was welcome, something I always felt he should have, as at that point he hasn’t really seen any combat and his only contact with war has been the bombing of Twelve. This is especially important considering the dark places the character will go to in Part 2. In the days previous to my watching the movie, I had grown increasingly paranoid that they would change Gale’s role to make him more openly antagonistic to Peeta, but I was relieved to see it wasn’t that bad; he only had that one scene, which I felt was justified and still fit to his way of thinking in the book. He stated his feelings about Peeta acting as a mouthpiece to the Capitol (which, as I’ve said before, I don’t feel are unreasonable), but when proven wrong, he made up for it— when Katniss pointed out Peeta didn’t know about District Twelve, Gale immediately backed off, and next thing we see is him volunteering to go rescue Peeta; he even tells her to go to him after the rescue, which is a good sign for their conversation in Part 2, one of my most anticipated moments. 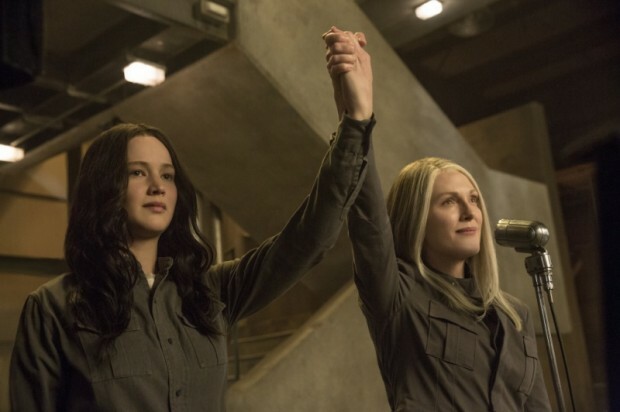 While things were different from the way they were in the book, I thought it was warranted; it is their difference in ideology that really breaks his friendship with Katniss in Part 2, and this was a way to take a first step toward that. I thought the changes were very well handled. The rest of the cast was great as expected, although I would’ve liked to see more of them. Haymitch’s few moments were great ones. Sam did well in conveying Finnick’s breakdown (that first scene of his was particularly harrowing for me), and he was amazing in his monologue during the rescue scene, but I wanted to see more of him just being around. I was really happy to see more of Beetee, and that they gave him a bit of warmth that was missing in Catching Fire. Prim was so sweet and so steadfast in trying to help Katniss; the scene in their room which felt “blah” to me when I saw it in the clip that was released pre-opening, was completely fantastic in full, and I think they did a good job with foreshadowing for Part 2. One thing I also loved was those little moments when Mrs. Everdeen attempted to be a mother to the two. They never actually state that she had “snapped out of her funk,” but you could see it from time to time. Also, props to Buttercup: his trip to Thirteen in Katniss’ bag and the crazy cat scene made the entire theater laugh. I’m usually not one to pay much attention to the music, because I always feel a good score is one that doesn’t stand out, because that takes you out of the scene. Therefore my saying that I didn’t pay attention to the score is actually a compliment: it means it only helped me submerge into the scenes to the point where I didn’t even hear the music anymore. The Hanging Tree piece, however, was absolutely brilliant, starting out with a slight folksy vibe and developing little by little into a grand orchestral/choral piece, just like the rebellion is meant to be. Jennifer Lawrence’s voice is fantastic—I get her hesitation, because it’s a very different voice, unlike what’s out there in mainstream music, but it gives the scene by the lake an almost indie feel. That’s an earworm if I’ve ever heard one, and the one track I will definitely be buying. 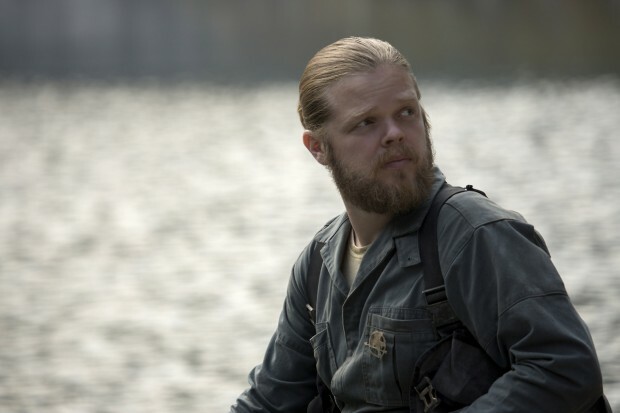 Pollux by the lake in District 12. With all of these aspects put together, I have to say that for a movie that is so stark, so focused on mostly one setting, they truly made that one setting come alive. I was dreading the Mockingjay adaptation because the book felt so introspective to me, like nothing much happened in the first half other than Katniss musing about her own pain, but they managed to convey those same internal feelings in the movie through the setting, the music and the wonderful performances in a way that made it interesting to watch. That’s not to say everything was perfect; there were certain parts I was expecting more from. 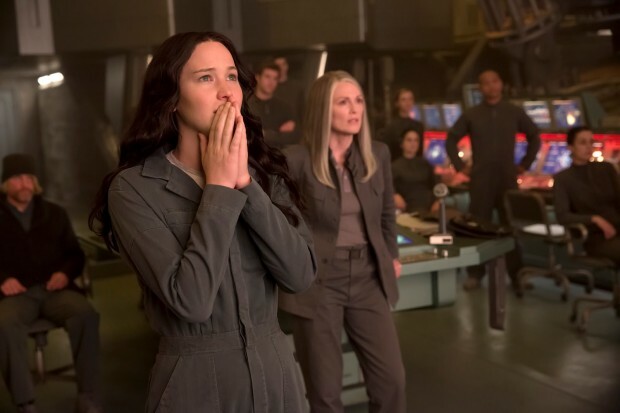 For example the scene of Katniss’ breakdown after the bombing in Thirteen, which is my favorite scene in the whole book, felt a little bland in the movie, comparatively. Katniss didn’t feel hysterical enough and the cut to the next scene felt almost abrupt. However, I’m not too disappointed, because the later scene of her breaking down when it seems like the rescue team is going to be captured/killed more than made up for it. The Katniss that falls into Haymitch’s arms trembling and repeating over and over that she’s going to lose them both, that’s the hysterical Katniss I wanted to see, so I’m willing to give them a pass on that one. I also have some issues with the dialogue. I kind of get what some of the critics meant now, that they were a bit heavy-handed with the inside-references. Don’t get me wrong: as a fangirl I love when we get little shout-outs to things that have happened in the past. (Ask any of my fellow senior staffers about my reaction to the reprise of the “Stay with me” scene. Go ahead. To say I was caught off guard is an understatement, and I can say with all certainty that was my favorite scene in the entire movie). But at some other points, it almost felt like they were pushing the references too hard, in a way that didn’t seem to flow naturally within the conversation. It was almost like they felt we had forgotten the stand-out lines from Catching Fire and they had to remind us. Thankfully it didn’t happen too often so as to put me off, but little moments like Plutarch saying Katniss had “forgotten who the real enemy is” or Prim stating that “she couldn’t live with herself” if she left Buttercup behind. Even Snow’s line of “moves and counter-moves,” though chilling in light of what it leads to, was a literal reprise of Plutarch’s line in the previous movie, and that was all I could think about when I heard it. I feel they could’ve said those things differently or even implicitly; we don’t need to have it stated verbatim/out loud to understand the parallels and the repeated themes. Coin and Katniss in District 13. Even with these little details that were a little off for me, I feel that as a whole, The Hunger Games: Mockingjay Part 1 is an amazing adaptation and a fantastic film; one that, despite the lesser amount of action than in previous installments, holds a tight grip on your heart and your emotions from beginning to end. I was very doubtful of the split, and in fact I was doubtful about Mockingjay being adapted as it was, because this book is so remarkably different from the previous two. But all my apprehension has been laid to rest now. The attention to detail paid was exquisite, and I definitely feel like I’ll need repeat viewings to be able to take everything in. At the moment, with one viewing under my belt, I can only reiterate that I loved it, and it’s definitely a much more successful, captivating and heart-wrenching adaptation than I could ever have hoped for.